The current water challenge in South Africa is the responsibility of all citizens to address. As a way to create awareness and talkability, and in line with its recently relaunched Sunlight 2in1 washing powder with SmartFoam, Sunlight has erected a billboard on Olifantsfontein off-ramp on the N1 Ben Schoeman Freeway. 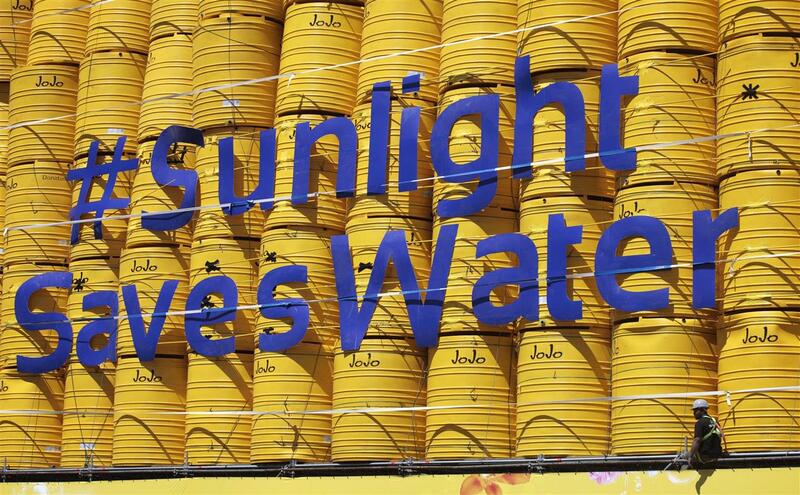 The 10-metre-high billboard is made of 80 yellow JOJO Tanks, which will be donated to communities across the country. South Africa has been hit with one of the worst droughts and has been listed as the 30th driest country in the world. To address the water challenges, water restrictions have been imposed to limit water consumption and wastage. Although an effective solution to curb water wastage, there are communities that have not experienced the luxury of running water in their homes and have had to rely on water from their local dams and rivers, and as a result, do not understand the restrictions to their only source of water. “Instead of just highlighting a problem, Sunlight is actively contributing in assisting to relieve the strain of limited access to water, and as a brand that primarily offers water-based products, has therefore relaunched its Sunlight 2in1 washing powder with SmartFoam, allowing households to save up to half the rinsing water, while easing the burden of laundry. 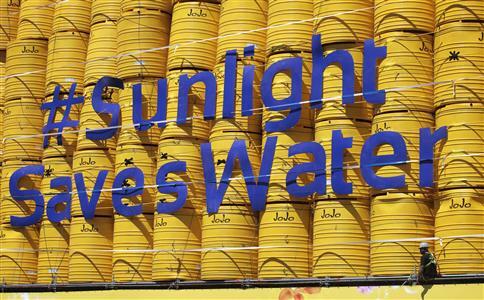 With the demand of water in the country outweighing supply, as part of the #SunlightSavesWater mission, JOJO Tanks are a smart way to harvest water because every drop of water counts,” says Caroline Blumick, Sunlight brand manager. Sunlight wanted to create a campaign that would generate interest on a large scale, resonate with ordinary South Africans, and help to amplify the water scarcity and water saving message. The billboard is, therefore, not just for show or to create awareness, but to assist communities in need too. Each week JOJO Tanks from the billboard will be dismantled and donated to communities across South Africa. The selection of communities to receive the tanks will be done through Facebook and radio. Each week, people are invited to nominate and vote for the community they feel needs the JOJO Tank the most, after which, two of the tanks will be dismantled and donated by Sunlight. Preceding the #SunlightSavesWater campaign, Sunlight hosted a water conservation panel discussion with key water experts and influencers such as the Department of Water & Sanitation, Water Research Commission and Johannesburg Water to highlight the seriousness of the challenges faced as well as to establish solutions for all stakeholders. Water leaks are a major concern for the government and to work towards addressing this, Sunlight embarked on a push tap installation programme in Johannesburg. A push tap allows water to be released only when the pressure of the hand is placed on the tap. Once the pressure is relieved, the water stops running. For those who will be participating in the nomination and voting of communities to receive the JOJO Tanks, a draw will be held where a winner will receive either R5000 or a year’s supply of Sunlight 2in1 washing powder with SmartFoam. Every drop of water saved counts. The hashtag #SunlightSavesWater will be used to keep members of the public abreast of Sunlight’s water saving initiatives and share practical tips on water conservation to ensure the nation is well equipped to address the water crisis. For more information, visit www.sunlight.co.za. Alternatively, connect with them on Facebook.